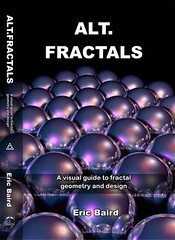 This is the "Teased Cube" fractal solid, rendered in transparent coloured material, and backlit. 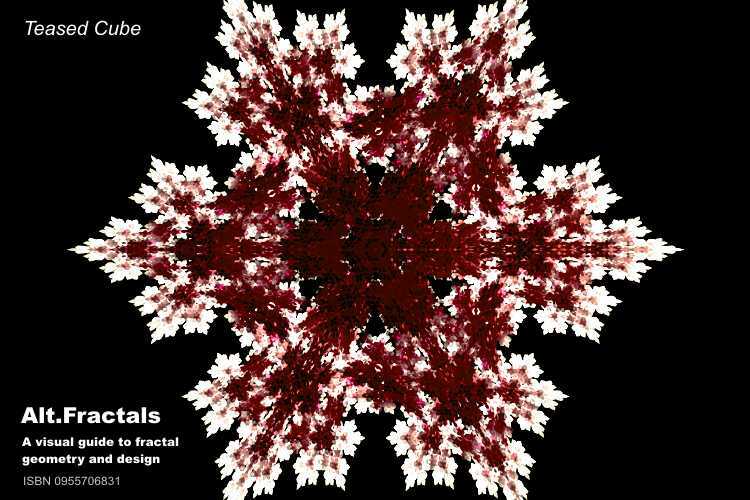 I thought it'd make a nice seasonal snowflake image for the blog. The version in the book (fig 3.17, p28) is clearer and easier to understand, but this image is prettier. And looks more like a snowflake. This is a physical example of something known as a DLA (Diffusion Limited Aggregation) fractal. I found it in my fridge. So what does DLA mean? The "aggregation" part means "collection of things stuck together" (in this case, water molecules from the air freezing on contact with the existing ice, and "aggregating" to produce a clump). The "diffusion-limited" part means that the aggregation process is hampered in some regions by the statistical difficulty of new material being able to wander into those regions without hitting another overhanging sticky-zone before it can get there. In two dimensions, DLA fractals tend to create long, straggly, self-avoiding strands that look like the roots of a small plant (book, figure 36.7, p182). In three dimensions it produces lumpy cauliflower-like clumps of the type found in my fridge. Once one piece of ice starts to protrude more than the others, it gets to snag more passing material than the other regions, and grows faster. And as it grows, it "shades" the more low-lying regions, and grabs the material that would otherwise have gotten to them, so they find it progressively more difficult to catch up. It's a positive-feedback process -- small initial random imbalances in height get exaggerated, and you end up with a pronounced pattern of overhanging clumps and deep valleys. The reason why it counts as a fractal (rather than just an example of low-pass-filtered noise) is because once you have a nice big blob of a clump, any small peaks or protrusions on top of that start to shield the lower-lying regions, and the differentiation process continues, giving clumps-on-clumps-on-clumps, and clefts-on-clumps, and clefts-in-clefts-in-clefts. The little pale brown speck is probably a breadcrumb. Zaha Hadid is an architect who designs annoyingly-good buildings. Here's what happened when Hadid designed some wallpaper. It's fractallish. And it's really cool. Again.